Shifting from darts to balls, this new line of Rival shooters from Nerf are hitting (and flying off the shelves at) record speedings, firing projectiles at 70 Miles Per Hour and featuring quick-reload features to keep the fun going faster. 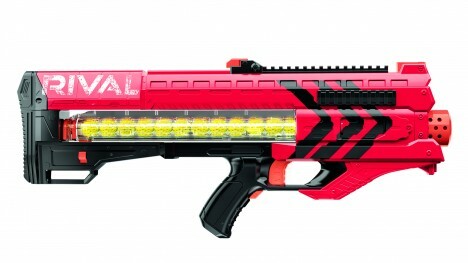 Announced months ago, made available for preorders in August and now openly for sale, the air-powered Apollo XV-700 and battery-powered flywheel rifle Zeus MXV-1200 both fire small round dimpled spheres. Like miniature golf balls, but softer, these depressions put spin on the balls, helping stabilize them for flight and making them far more accurate than even a tail-feathered Nerf dart. The Apollo model stores air in the stock of the gun and lets you reload by dropping the bottom of your handle/clip on top of expended ammunition. Overall, these definitely seem targeted, so to speak, at adults who are looking to get back into the game with a bit more firepower than traditional for-kids equivalents would allow. 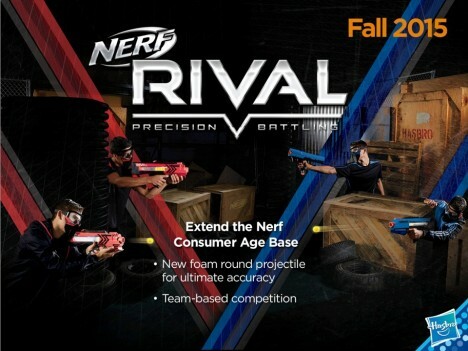 If anything, these are more competition for laser tag or paintball than other Nerf products. They also each come in both red and blue, implying a design decision to help make team games easier as well. See more in Home & Personal or under Gadgets. September, 2015.